"George Lavenia has given us a very special gift  great and wonderful wisdom in a small and wonderful package. You cannot help but benefit from this book. Its clarity and insight are a treasure for the soul." "There is much food for action here"
"What You Think Is What You Get is useful and wise. Really Good Stuff."
"What makes [What You Think is What You Get] different is the simplicity of exposition and the power of the examples and the quotes, sayings and meditations. Savor it like a fine wine and spend hours following each train of thought it opens up. It will be time well spent." "Through Lavenia comes a useful statement of the uncommon common sense that manifests out of the spirit." "I so appreciate the inspiration of each short chapter, each one clearly reminds me of the truth." Not just another book on spirituality and self-improvement, What You Think Is What You Get is controversial in as much as it is a departure from convention. Author, George Lavenia, does not agree with others who claim that to overcome the conditioning from our past requires a healing process that calls for hard work, time, and outside assistance. He tells us this is a false notion, which only strengthens the belief that a real problem exists requiring our attention and effort to overcome. What You Think Is What You Get empowers the reader with uncommon knowledge about our human potential, informing us that we need not use a method of any kind to find freedom from limitations. As George puts it, you don't have to look for perfection when perfection is where you come from. What You Think Is What You Get is a gripping book that cuts right to the heart of the human problem. This book is for anyone who is sincere about finding the truth about his or her real self and true nature which Lavenia points out is the experience of mental, physical, and spiritual well-being and the innate ability to create what your heart desires. You owe it to yourself to read this book and to take full advantage of what it offers. What You Think Is What You Get is a powerful tool that has the potential to transform the quality of your life. George Lavenia doesn't seek to impart some new beliefs on his readers to replace old ones; his words go beyond our belief systems and straight to that part of us that is who we really are. The chapters, short and to the point, direct themselves to what it is to be human. Each of us is responsible for creating our own life experiences. We also have the power to change situations that are not to our liking. Author George Lavenia begins the journey with the big question, "Who Am I." Taking responsibility for our actions, letting go of anger, and changing negative patterns is the first step to a fulfilled present. Each chapter ends with a quote. The quotes are summaries of the chapters. One such gem is "If you stopped resisting the situations that upset you, you would be free from their effect, since it's your resistance to situations that causes you to get upset over them. You see, Life is perfect the way it is. And all you have to do to enjoy it is to accept it that way." Lavenia wants his readers to realize their true potential and to take action to achieve it. He wants his readers to understand that obstacles are really lessons in disguise. "You are the way. You don't have to wait to get there because you are already there. An enlightened person is simply someone who found out!" This quick read is filled with common sense, and it comes from Lavenia's quest for self-knowledge. Your worst enemy cannot harm you as much as your own thoughts. Not only did The Dharmapada make this a clear and useful mantra, so has George Lavenia with What You Think is What You Get. Ram Dass says, "Through Lavenia comes a useful statement of the uncommon common sense that manifest our of the spirit." Lavenia's no-philosophy philosophy rests on the practical premise that each of us is responsible for creating our own life experiences, useful for those who want to learn to stop the cycle of anger, resentment and guilt. After following various spiritual paths, he retired as vice president of a New York Bank and chose, finally, the path of self-inquiry. Out of this came The Earth Foundation, an educational organization dedicated to mental and physical well-being. 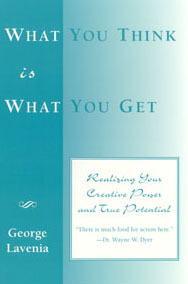 Review the Chapters and read excerpts from What You Think Is What You Get .